Whether your Valentine’s day plans involve a romantic night out 💃, a candle-lit dinner 🔥 at home or a Valentine's singles party 🎉 @aesthetics11sa 👄 have teamed up with @dermagurusa to help you look and feel your best this Valentines day! Join us for a day of love & pampering at our “All you need is Love” ❤ Treatment day and receive R100 off a ✨ZO Hydraflash Facial ✨treatment from leading medical skin care brand ZO Skin Health. *If you purchase a ZO skin health product on the day, you will receive your facial treatment for🌹FREE! 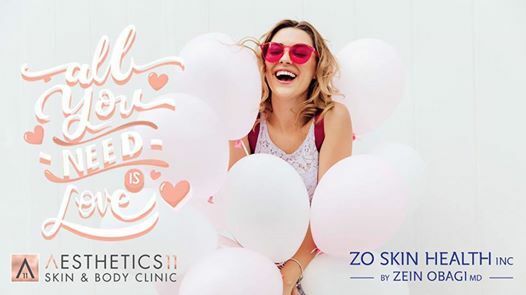 You’ll be treated to cupcakes 🎂 and refreshments plus you stand the chance to win ZO Skin health products in our “All you need is love” 💕competition! The Hydraflash Facial ⚡from ZO Skin Health is the perfect pre-valentines facial to brighten your complexion, improve skin texture, plump your skin with moisture and calm any breakouts or redness for immediately glowing, smoother and clearer skin. Get ready to ❤ yourself this Valentine's! 📩 DM us if you would like to receive a personal invitation. Spaces are limited and subject to availability.